As a pet owner, you love your pets very much. One downside is that you may not like your floors look in your home. Dog and cat paws come with claws, and these can damage your floors. Some pets, especially puppies, might leave some messes behind that simply won’t go away no matter how much scrubbing and cleaning you do. You may feel awkward talking to a flooring expert about how well your options for flooring will hold up to hairballs or puppy accidents, but a professional understands that your home’s flooring needs to be ready to deal with anything your fur baby can throw at it. Educate yourself on some ideas for pet-resistant flooring, so you can find the best flooring for pets. You want flooring that will keep up with your active pet and can withstand damage from active animals. Your floor must resist scratches made by paws and claws. You also want your flooring to handle messes, wetness and potty accidents. Also, you may want to look for flooring that doesn’t have a huge amount of crevices since those may make it harder to clean up any spills that occur. At the same time, flooring should offer traction, so your pets don’t slip and slide while chasing a ball down the halls. Floors might also create a comfortable surface upon which your pets can rest. 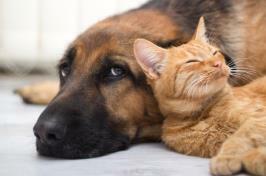 These factors may help to keep your pets happy and healthy. Each of these features is vital to finding a flooring option that you’ll fall in love with as a pet owner. Fortunately, there are a variety of options when it comes to choosing pet-friendly flooring for your living spaces. There is sure to be a floor that suits your budget and decorating preferences. Pet owners will love all the features that make vinyl flooring a great option for pets. Vinyl offers water resistance, traction, scratch resistance and durability against high-traffic damage. It also has the benefit of being very easy to clean. There are plenty of attractive designs and colors that can fit in just about any color scheme. Bamboo is a pretty hot flooring option right now, and there’s a good reason for that fact. It’s an eco-friendly option that is helping the environment because bamboo is easily grown. Bamboo is great for pet owners because it’s harder than most woods, and this makes it more durable. 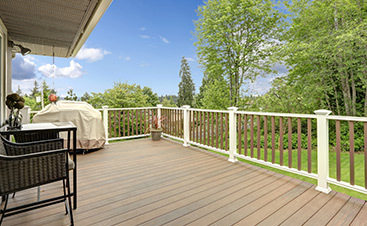 It’s more scratch-resistant and can handle your high-traffic areas. Plus, this option is very easy to clean and maintain. Although this isn’t completely water-resistant, it does offer some protection in case of spills, dribbles, and accidents. 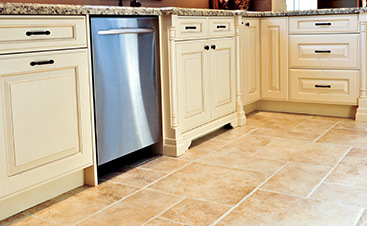 Stone tiles are a classic flooring that works great for pets. The feeling of stone on the bottom of your pet’s paws will keep them from feeling as though they need to scratch the flooring. Stone tile is durable and resistant to scratching. It’s also easy to clean and works great for instances where accidents can happen. It may not be comfortable for your pets to sleep on, however. 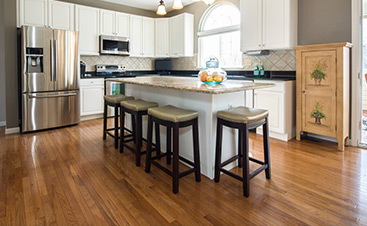 Laminate flooring offers the look of hardwood while being very durable and scratch resistant. This is a great option for pet owners, but one thing to keep in mind is that laminate might present a very slippery surface for pet paws. Address this issue with some throw rugs to keep your pet from sliding. One other potential issue is spills as this flooring may absorb the mess. Not only should you look for the best flooring option for your pet, but you can also consider what is best for your pet and what you can do to keep your flooring looking its best long after it has been installed. For instance, if you get flooring that doesn’t address comfort, you can place throw rugs or pet beds in the area to give your pets a comfortable place to rest. You can also help the surface of your flooring by getting your pet’s nails trimmed often or invest in the plastic caps that keep them from scratching. You should clean up any pet messes as soon as they occur using the right cleaning supplies for the job because leaving it to sit for long periods of time could impact your flooring. Your pets are part of the family and should be kept in mind when finding the right flooring for your home. Picking the wrong flooring may mean that it doesn’t hold up very well to the constant bombardment of paws as they chase toys, spill water bowls, and simply go about their daily lives. Let these options help you to narrow down your choices. Speak to a flooring expert about the best brands and styles available of your choice of material types.